Thanks to television programming on channels like the Food Network, the Cooking Channel, Bravo, and the Travel Channel, chefs have become celebrities and valuable brands. As airports around the United States continue to upgrade their restaurant offerings, many are looking to celebrity chef-branded eateries. And these restaurants offer everything from high-end cuisine to down-home country food, with something for everyone. "Top Chef" two-time contestant Chef Mike Isabella opened Greek isle-inspired restaurant Kapnos Taverna, at Ronald Reagan Washington National Airport. Chef Roger Mooking's concept, Twist, is located at Toronto-Pearson International Airport. He's the host of "Man Fire Food" on the Cooking Channel and serves as a judge on "Chopped Canada." Award-winning Chef Bryan Caswell created 3rd Bar Oyster & Eating House located at Houston George Bush Intercontinental Airport. His accolades include the 2009 Best New Chef Award from Food & Wine, Semifinalist for the James Beard 2011 Best Southwestern Chef, and a spot on the Continental Airlines Congress of Chefs. Wolfgang Puck Express, at Hartsfield-Jackson, Boston-Logan, Charlotte-Douglas, Chicago O’Hare, Cincinnati/Northern Kentucky, Denver International, Indianapolis International, JFK, Los Angeles International, and McCarran International airports. Chef Anne Burrell’s Vagabond Burger Bar, in LaGuardia’s Terminal C.
OTG has also partnered with United Airlines to completely revamp the carrier’s Terminal 3 at hub Newark-Liberty International Airport. 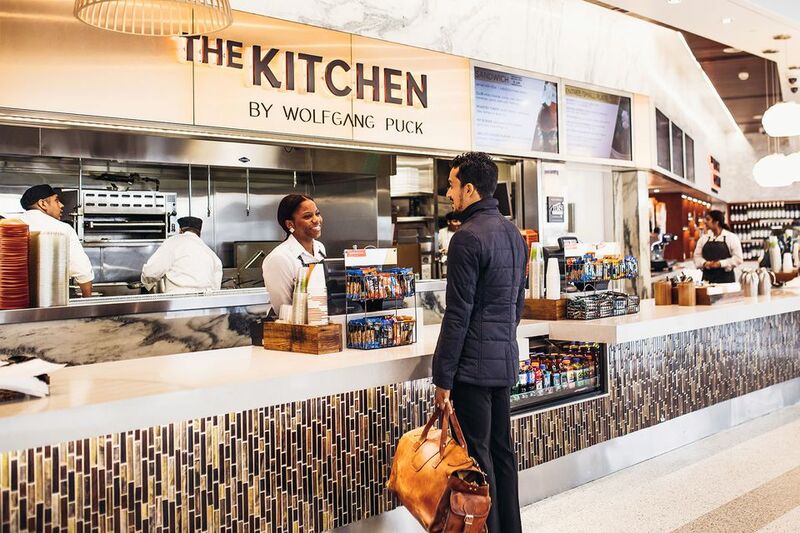 Celebrity chefs with outlets planned at the upgraded terminal include Michelin-starred Chef Alain Ducasse; Iron Chef Mark Forgione; Chef Amanda Freitag; Iron Chef Jose Garces; Iron Chef Alex Guarnaschelli; and Top Chef contestant Dale Talde. G. Garvin’s Low Country, at Hartsfield-Jackson’s Concourse A. Food Network Kitchen at Fort Lauderdale-Hollywood International Airport’s Terminal 3, Concourse F.
And Cleveland-based United Concessions Group has opened ​Iron Chef Michael Symon’s Bar Symon at Washington Dulles and Pittsburgh airports. So the next time you're in the airport, check out their famous eats. Food upgrades land at airports via concessions operator Delaware North.